♻Aluminium Foil, Trays and Pans: Recycle! Remove ALL food/liquids and recycle in your single stream bin (Scrape any chunks you can with a spatula and empty all liquids). For foil, crumple up in a ball to help our equipment recognize it. ♻Vegetable Metal Cans and Other Tin Food Cans: Recycle! Remove ALL food/liquids and recycle in your single stream bin. Lid can be attached if container is empty. ♻Plastic Food Tubs, Bottles, Jugs (Sour Cream, Juice, Vegetable Oil, etc): Recycle! Remove ALL food/liquids and recycle in your single stream bin. Lid can be attached if container is empty. ♻Glass Food Jars (Gravy, Pickles, Jams, etc): Recycle! Remove ALL food/liquids and recycle in your single stream bin. Lid can be attached if container is empty. *NOTICE* Glass is not accepted by all haulers or cities, check with your service provider requirements. ♻Aerosol Food Cans (Whipped Cream, Oil Spray): Recycle! Empty ALL food/liquid contents and recycle in your single stream bin. 樂Other Paper Waste from Cooking: Usually trash, but if truly made of ONLY paper (no plastic or other material layer), recycle in your single stream bin. Make sure no food residue or liquids have contaminated it. 樂Other Plastic Waste from Cooking: All plastic bottles, tubs and jugs can be recycled if clean of food residue (see our guide on how clean is clean). Any type of plastic that’s not a bottle, tub, jug or film… do not recycle. ♻Disposable Paper Cups (Coffee Cups, Cold Cups): Recycle! Just make sure it’s empty and remove any plastic lids or straws. ♻Beverage Glass and Plastic Bottles: Recycle! Empty the liquid and recycle in your single stream bin. Lid can be attached if container is empty. ♻Beverage Cans: Recycle! Just empty the liquid. Disposable Plastic Cups (Styrofoam & Plastic “Solo” Cups): DO NOT RECYCLE! These are not recyclable. Styrofoam and Solo cups are not recyclable in Sioux Falls. 樂Disposable Plates: Usually trash, but if COMPLETELY clean of food and liquids and made of ONLY paper (no plastics), you can recycle in your single stream bin. Disposable Silverware: DO NOT RECYCLE! These types of plastics are not recyclable, reuse as much as possible for all your snacks, meal and dessert, and then throw away. Metal Silverware, Cutlery, Knives, Pots and Pans: DO NOT RECYCLE! If you need to toss these out for some reason, do not recycle in your bin. Scrap metal can be taken to special metal processors like TJN in Sioux Falls, but cannot be recycled in your recycling bin. They can damage our equipment and hurt our employees. Please keep scrap metal out. Napkins, Paper Towels and Tissues: DO NOT RECYCLE! These cannot be recycled, click here to learn why. They may be composted though if you want to keep them out of the trash! Otherwise, these belong in the trash bin. Leftover Food: DO NOT RECYCLE! Food contaminates everything in your recycling bin, the recycling truck, and the recycling facility! Instead, donate your delicious leftovers to families that will enjoy it through a local food pantry, or save them in your fridge or freezer to enjoy later. Food Scraps: DO NOT RECYCLE! Try composting food scraps to keep them out of your trash. Otherwise, these belong in the trash bin. Decorations: DO NOT RECYCLE! Decorations like ceramic turkeys, candles, plastic flowers, pumpkins, lights, plastic pilgrims, etc are often made of non-recyclable material or a mix of many materials. These can either be donated to a thrift store, saved for future use, or belong in the trash if broken. Remember, the only plastics that can be recycled are bottles, tubs, and jugs; the only glass that can be recycled is bottles and Jars; the only metal accepted in your single stream bin is cans. Table Cloths:DO NOT RECYCLE! Cloth or fabric is NOT recyclable, instead donate to a thrift store so it can be reused. Plastic table cloths have many different additives/chemicals added to them that make them water resistant and cannot be recycled. These belong in the TRASH. ♻Plastic Cleaning Containers (Window Cleaner, Disinfectant spray, etc): Recycle! Remove and toss the lid or nozzle to make sure all chemicals can air out and completely empty. If hazardous, please triple rinse. Recycle in single stream bin only if completely empty! Did we miss something? Let us know! Ask us on Facebook or send us a message. 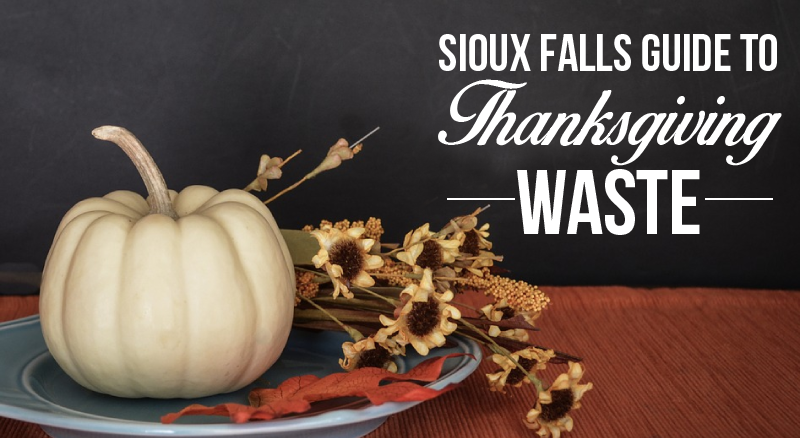 Thanks for recycling Sioux Falls and enjoy your holiday! There are 0 comment. on "Thanksiving Waste Guide"